Fast food is sold all over the world, it is quick, cheap and easy to get when you’re in a hurry. In the west when we think of fast food we think of burger restaurants selling burgers and fries that often don’t taste that great and leave you feeling even worse. However in other parts of the world fast food can not only be flavorful but healthy as well. Shawarma is the Middle Eastern contribution to fast food and it is delicious! Now you can find shawarma restaurants all over the world offering up this quick and tasty treat. Shawarma is basically a sandwich, although that really doesn’t do it justice, it is far more delicious than a plain old sandwich. It is a wrap made with pita bread although it can be made from a tortilla as well, and it is stuffed with a good amount of meat and vegetables along with the traditional Arab sauces. 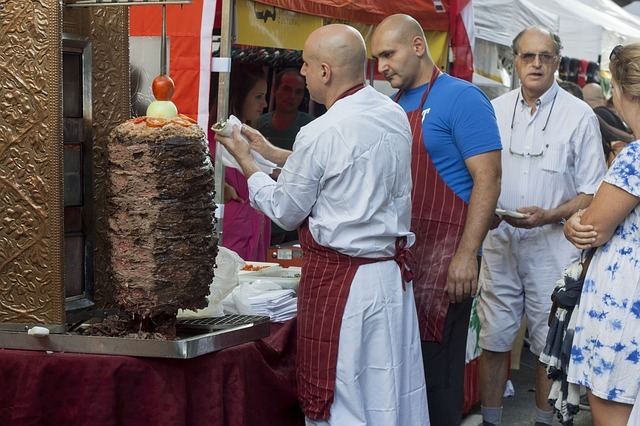 The meat used in traditional Shawarma can be chicken, beef, veal, mutton, lamb or turkey but never pork. However if you are eating Shawarma outside of the Middle East it is likely to be made from either chicken or beef. No matter the type of meat that is used the cooking process is the same. The meat is marinated in spices for hours first before being put onto a spit and slow roasted for hours making sure it is flavorful and tender. As you order your Shawarma the meat is sliced right off the spit to be rolled up into the pita. It is always fresh and hot. Here is a look at how it is cooked. In addition to the spicy meat found in Shawarma there are also a variety of sauces you put on it to make it even more delicious. 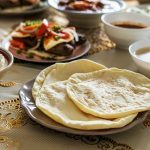 Often chili sauce, vinegar or mayonnaise can be added, but many prefer it with the traditional Arab sauces like hummus and/or tahini. Vegetables like, onion, tomato, cucumber, turnip or tabouli salad are also added to the Shawarma and you can add any or all of them depending on your preference. The next time that you are in a hurry and you’re starving, instead of grabbing another burger that tastes like cardboard you might want to try Shawarma instead. 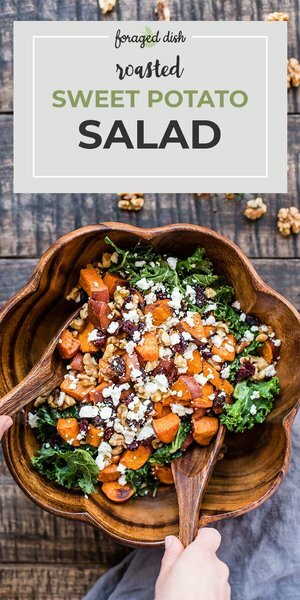 You can have a healthy and tasty meal that is both quick and far healthier than typically greasy fast food fare.